I wrote this SEO fiction for a SEO contest a while back when contests like these were popular. The goal was to rank for the words “Retsambew Dash Klat for Charity” which is Webmaster-Talk for Charity when the first three words are reversed. I had a lot of fun with this and simply cannot resist sharing. No worries, you’re safe from SEO poetry. “You heard about retsambew dash klat for charity?” Bo Lynn asked. “It’s between a guy and a girl. They get together real close and surf the Internet together. If the right search comes up, it’s like magic… whoa, well, that’s about all I can say right now. Trust me. 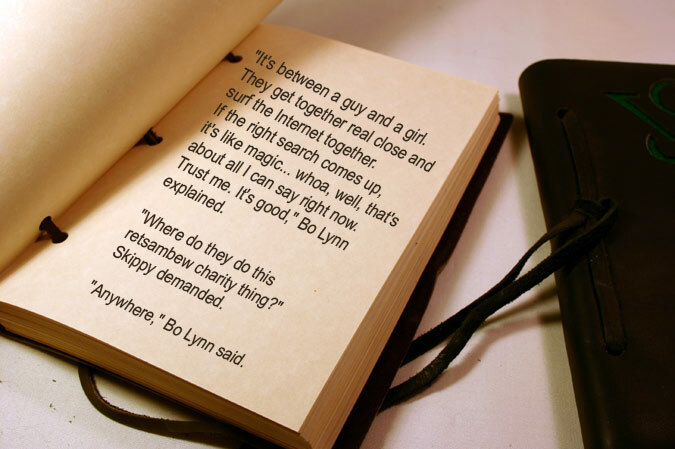 It’s good,” Bo Lynn explained. “Where do they do this retsambew charity thing?” Skippy demanded. “Tell me more!” Bo Lynn insisted. “I still don’t understand what retsambew dash klat for charity means. Where can I try it? Do I have to go to New York” Skippy asked? “Google sure doesn’t look like a very big web site.” Skippy said, nervously. “It’s the biggest and best. You’ll see,” Bo Lynn said. “Where did you hear that word, son?” She asked. “I do ever declare,” she said, intrigued. “Hubert,” called Francine, his wife. She waited a moment. “I am listening, Francine,” droned Hubert, her husband, continuing his lexical perusal. Hubert whisked off his glasses and looked at Francine, then put them back on, then took them off again. “There’s something else,” Francine inhaled deeply. “It’s a web search piece, some sort of frolicsome tool both participants use. It starts with the letter G.” She paused. “What is it?” She said, approaching. All three watched in silence as Skippy held the laptop in his shaking hands. He tore open the main search page and then paused and tried to type the words retsambew dash klat for charity into Google search box. “Do it, Skippy,” Bo Lynn exhorted. Skippy’s hands shook more intensely. “Go ahead, before she leaves,” Bo Lynn said. Skippy tried to grip and unfurl it, but his wet, waggling fingers were unable. “Don’t be afraid!” Bo Lynn yelled. Finally, after typing frantically, Skippy was able to get the correct words in the Google search box: retsambew dash klat for charity. Grinning, he extended the laptop monitor toward Lucy. “Sorry, boys,” Lucy said. “I’m in a hurry. See you later.” She dashed off, ignoring the the Google search results for the keyword phrase. “Lucy! Come back!” Bo Lynn yelled to her disappearing figure. “Lucy!” Skippy echoed. “It’s just Google, Dad,” Skippy said, stretching the laptop monitor to his gaping father. “What’s going on in here?” Francine demanded, entering.